Steamed bean curd rolls are a uniquely Taiwanese take on the ubiquitous Japanese sushi roll. 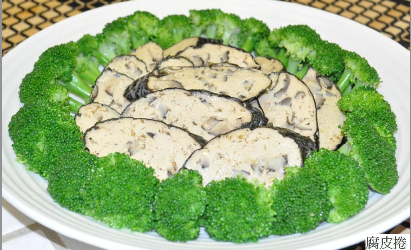 Tear bean curd sheets into strips and add the mushroom, which you have soaked and cut into strips. Place bean curd strips and mushroom strips into a large bowl. Add egg, salt, ground pepper, sesame oil and sugar into the bowl and mix gently. Place one seaweed sheet on a flat surface to serve as wrapper. 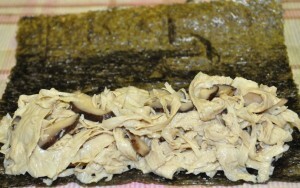 Put one-fourth (1/4) of the mixture on one end of seaweed sheet, so that it covers 1/3 of the sheet. Roll the seaweed sheet up as if you were rolling a sushi roll. Repeat with the rest of the mixture. You should be able to make a total of 4 rolls. Wrap each roll in Saran premium wrap and use a steamer to steam the rolls on high heat for approximately 10 minutes. 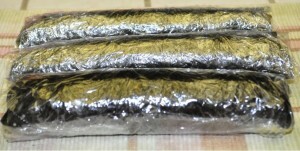 Let rolls cool down, remove the Saran wrap and slice the rolls into half-inch (1 cm) thick pieces. Decorate with green vegetables if desired. Drizzle lightly with sesame oil and serve. To enhance flavor, you can sauté mushroom strips with some of the cooking oil first. This dish can be made ahead and served in either cold or hot. What is bean curd sheet? 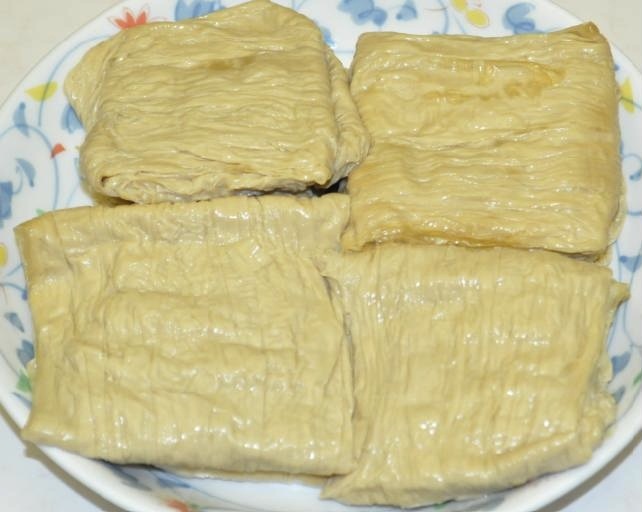 Bean curd sheet, known also as tofu skin, is food product made from soybeans. When soy milk is boiled in an open pan, a film or skin forms on the liquid surface and is then dried into yellowish sheets. You can learn more about tofu skin here.